Now that one project is finished, it's time to look for the materials for the next project. I have decided to finish something I started several years ago. but I couldn't quite lay my hands on the item to be finished. As you know, every project is a multi-step adventure. It's not just, "I'm going to sweep the floor." Sweeping the floor means moving a few things to get the dust from behind them. It means picking things up off the floor. Then you need to put those things away not leave them in a pile "to be dealt with later", as I can so very easily do. So, finding the next project involved a search. It wasn't in this box or that box. It wasn't tucked in this drawer or set on this shelf. Maybe it was in this box in the closet. No, it wasn't but I found something I can give away. That was stuffed into a garbage bag for the next veterans group that calls soliciting donations. 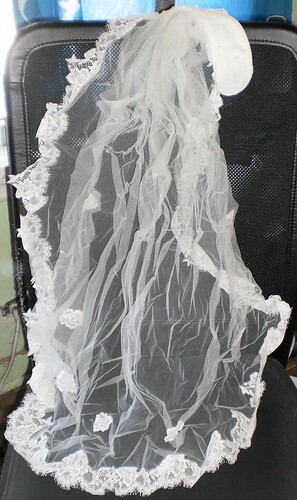 I also found my wedding veil. This item is nearly 34 years old. Other than being crinkled, it still looks like it did the day I wore it. What do I do with it? It was handmade by the owner of the shop where I got my dress. She matched the lace on the veil to the lace on my dress. I still have my dress, too. It's in a storage bin in the basement. I don't have a clue what to do with these things. Do I donate them to Goodwill? Do I try to eBay them? There is a growing market for vintage items and these fall into the vintage category. I'll never wear them again. If ever I would walk down the aisle again, it will be in something else. My tastes have changed. I folded it up and stuck it back in the closet. While I am feeling the desire to purge my house of items I no longer use, I'm on the fence about this. Any suggestions?